In the process of approaching Foundations for seed money, MMMMFI discovered another organization with a similar mission which had been operating since 1991 under the name Wings of Mercy, Inc. in Holland, MI. Their Founder and President, Peter VandenBosch, soon suggested that MMMMFI’s Board consider becoming an independent chapter of Wings of Mercy in order to increase service to more Michigan residents. In early 1996 an agreement was reached and MMMMFI changed its name to Wings of Mercy East Michigan, Inc.
Wings of Mercy East Michigan, Inc. has continued to grow since the first patient flight in July of 1996. We have passed several milestones after that first mission to return a heart transplant patient from the Mayo Clinic. We have seen 500 Missions, 1000 Missions, 1,000,000 Miles, 1500 Missions, and we are still growing. We have formed a long term alliance with another organization, Volunteer Mercy Pilots in Lansing, MI to further increase our outreach. We make an immeasurable difference for our family of over 275 Recipients. Scores have told us that without this service they would not have found life saving treatment. Wings of Mercy levels the playing field, giving the gift of transportation to those who otherwise might not be able to take advantage of distant medical care. Based on experience, upwards of 80% of our clients would not be able to receive specialized medical treatment if our service was not availa ble. The most frequent destination for our flights is the Mayo Clinic in Rochester, MN. The second most frequent destination is the University of Wisconsin in Madison. Together, these two destinations have and continue to account for 65% of our flights. In addition we have flown to St Jude’s in Memphis, Duke Medical Center in Durham, Johns Hopkins in Baltimore, Boston Children's Hospital, McGill University Health Care Centre in Montreal, Quebec, National Institutes of Health in Bethesda, Cancer Treatment Centers of America in Waukegon, IL, University of Pittsburg, University of Minnesota, Cleveland Clinic, and Sloan Kettering in New York City, We have served over 119 East Michigan communities from Lansing to Cheboygan to Alpena to East Tawas to Bad Axe, Port Huron, Detroit, Ann Arbor, Howell and Flint. Our unique service allows us to access nearby community airports that further eases the logistics of travel for our Recipients. Wings of Mercy is not a Charter company, nor an FAA Certified Air Carrier. We are not an air ambulance. Wings of Mercy does not compete with commercial airlines, which our patients/clients cannot afford, or with air ambulance services, which are reserved for the more critically. Rather, we are Private Pilots operating under the General Flight Rules of the Federal Aviation Regulations (FAR Part 91). We are essentially no different than one who gives a ride to a hospital in their personal car, except we travel 500 miles in 2-3 hours. 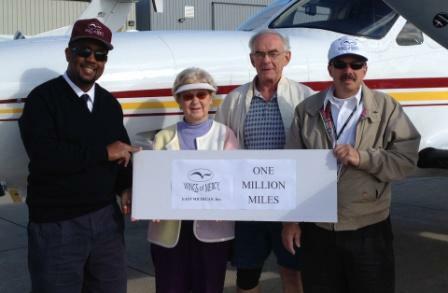 The use of our aircraft is donated by generous owners and normally flown by those individuals. We ask our pilots to exceed the FAA standards whenever possible. For example, we always fly with a second pilot even though our planes are certified for single pilot operations. We have been blessed with over 100 different aircraft and in excess of 300 pilots who have participated in these flights. Wings of Mercy East Michigan is funded entirely by charitable contributions from Individuals, Corporations, Foundations, and Churches. These donors are as important as the pilots who fly the planes and the volunteers who set up the missions. In other words, we are a team of dedicated people from different walks of life who thrive on helping others. We have no paid staff. We are an IRS recognized 501(c)(3) Not for Profit Michigan Corporation in good standing. All trips begin with a patient or family member calling us via at (888) 32-MERCY. Our Screening Coordinator gathers information and informs the caller as to our capabilities, as well as our limitations. He determines financial eligibility and asks that the patient obtain a Doctor's okay to fly in an un-pressurized general aviation aircraft that may require climbing up 2-3 steps for entry. After the approval process is completed, our Screening Coordinator passes the information to our Flight Coordinator who then matches the pilots, planes and dates of travel with the Recipient’s needs. Click on "pause" to read in detail. Click on "play" to continue.